Blue Elderberry is a beautiful shrub, or tree, that produces edible fruit and is loved by wildlife. This shrub grows in rounded, convex fashion, producing large clusters of cream to white flowers, which ripen to edible berries in the summer. If you would like to wake up to the sound of happy birds then be sure to plant one! The fruit is adored by birds, while bees and other native pollinators. are especially fond of the white flowers. The leaves are a lighter shade of medium green, having small serrated edges around the tips. Elderberry can adapt to most any climate and soil conditions, though some irrigation is needed to establish. 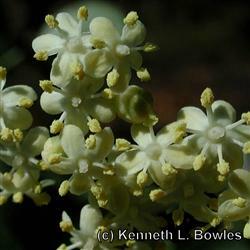 Elderberry is fast growing and can reach 25'-30' high and spread about 20' so give this shrub room to grow. It is very adaptable, thriving beside a stream, water source or irrigated lawn, but will also survive drought conditions once established. In drought conditions it will drop its leaves, or many of them, in the late summer and fall, greening up again with the winter rains and cooler temperatures. The berries can be used for jams and jellies, juices and wines, but be sure to make sure you select nice ripe berries. The leaves, stems and bark of Elderberry are poisonous. Elderberry has also been used extensively in medicinal treatments.